The Palestinian problem is one that many Egyptians get very emotional about. The sense of historic injustice and the ambivalence with which the West and most of the world often seems to be dealing with it, makes it an open and festering sore in consciousness of most Arabs. However, it has repeatedly been used by the Egyptian government for more than fifty years to deflect attention from pressing national issues, while half-heartedly (or worse) pursuing a solution. 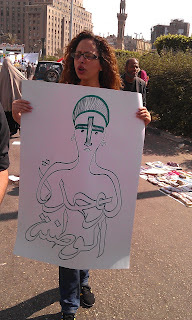 I could not help but feel that the same dynamic was in play yesterday when I was walking through Tahrir. The call for solidarity with the Palestinian intifada, is one that is bound to resonate with most Egyptians and revolutionaries in particular. The revolution was, to a great extent, about justice in the widest possible sense. The pain and indignities that Palestinians suffer presents a capital case for an injustice that has to be resolved. However, to have this issue trump pressing Egyptian pains and problems right now makes me quite suspicious of the motives of those who are putting the Palestinian problem front and center. There was a strong presence of the Muslim Brotherhood (MB) and they seem to have dominated many of the speaker stands. I could see many MB members with green bandannas with their ominously distinctive logo that juxtaposes swords and the Koran. The polemics that were echoing through the square went as far as calling for holy march to Jerusalem and had blatantly religious undertones. 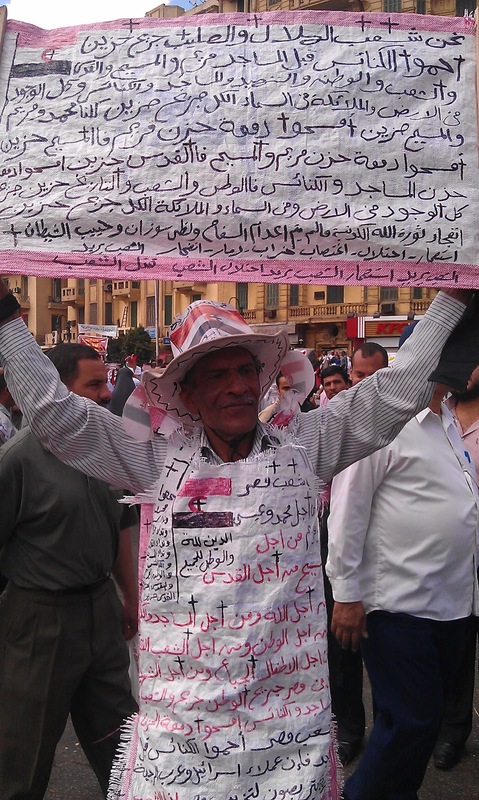 That did not feel like the Tahrir that I know and love. 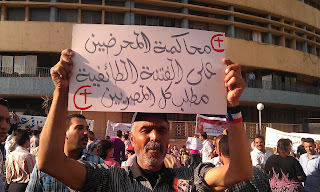 The pain of the Copts due the ugly events in Imbaba. The illusive and faceless SCAF that seems to be writing the rules of the political game singlehandedly. The detainees of the revolution. The upcoming parliamentary elections that will define the constitution of Egypt. The MB seems to be wasting very little time with regards to the last issue. They are working actively to muster support and in campuses the are all out giving speeches about their outlook and their program. In Tahrir, I could not be help but feel that the MB are trying to distract the masses with Palestine while our Egyptian house is in a great deal of disarray. But, maybe it would unfair to blame it all on the MB, I could see many holding up pictures of the late president Nasser who is famous calling for pan-Arab unity (as well as the eradication of Israel). All was not doom, gloom and holy war in Tahrir. I has happy the see the El-Adl party organize a group based artwork on the dreams for Egypt. They fashioned an Egyptian flag out of bits of colored papers that many in Tahrir scribbled on their dreams for the country. The sense of humor was there in the form of creative placards. Many also on Tahrir had there eyes clearly focused on national unity. However, they were a bit less visible and less vocal. 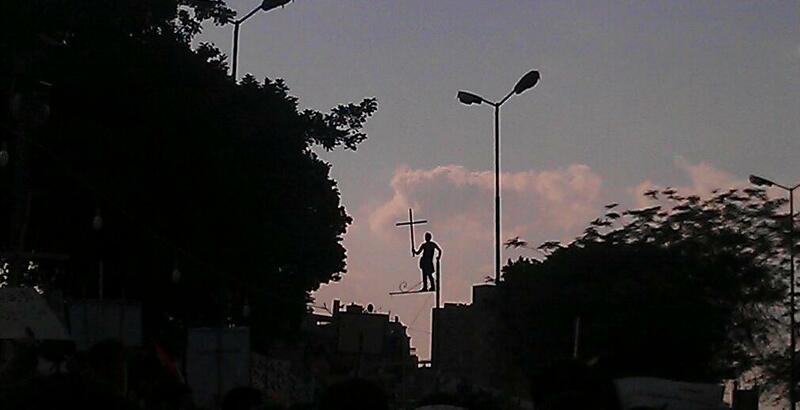 One can but only feel a palpable sense of pain at Maspero. As I walked into the sit-in area I had to pass through a checkpoint where they looked at my ID and conducted a pat-down search. 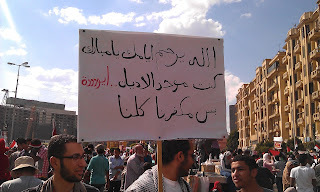 The people at Maspero seemed nervously happy to have a Muslim amongst them. There many excited chanted call for a secular state, and also asserting pride in the Coptic identity. While I could but not but help feel the deepest sympathy for their pain and plight, I suddenly grew very nostalgic to good old days in Tahrir when religious distinctions were of limited consequences as all Egyptian were clearly united. However, in many respects Maspero felt more like the old Tahrir, it was clean and had a clear focus. There were no street vendors and people were sharing food and water. While I am not calling for abandoning the Palestinian cause or the dream of pan-Arabism, I believe that there is great loss of focus and we are being dragged by historical issues and all the pains they bring. We are not putting sufficient energy in dreaming about a brighter future for all Egyptians.